Whether you need your custom printed tab dividers to organise files or to make a creative marketing statement, Intertype has special configurations to suit all requirements including economy, heavy duty and premium. 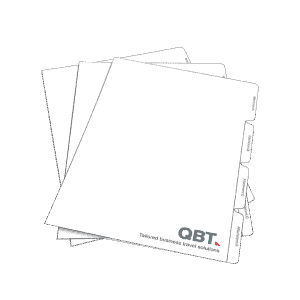 All tab dividers are made in Australia, conform to the “Peace of Mind” sustainability standards and are custom printed to your specific tab divider requirements. Let your tab dividers tell a visual story, reinforce your value proposition and make it easy for the tender response reviewers to navigate through your tender response. 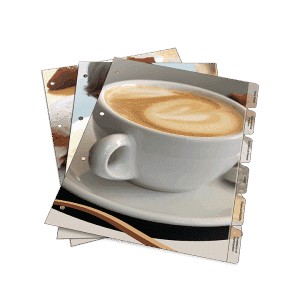 Your tab dividers can help display your products and reinforce your brand while making it easy for your customers to find what they are looking for. Price lists tend to be heavily used so your tab dividers need to stand up to wear and tear. Designing the printing of your tab divider will allow you provide easy t follow instructions to make your customers life easier. 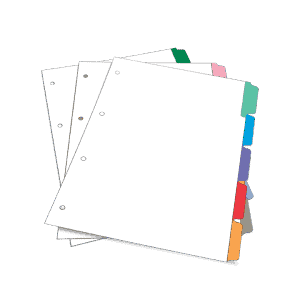 Whether you’re preparing documents for a court case, annual financial reports, Company Registers or simply archiving files, Intertype has a range of pre-printed tab dividers to suit or custom configurations are easily catered for. The most demanding environments require the toughest tab and index dividers. Your tab dividers must stand the test of time, be re-usable all while not harbouring germs. Tab dividers in menus is the toughest application of all tab dividers. Your menu tab dividers must stand the test of time, stand up to constant use every day and be water proof. 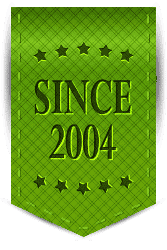 Do you want to make a statement or complement your ring binders? Then this option is for you. You can’t go past this option when you need your tab or index dividers to last. Then this option is for you.